Is it possible to put a price on peace of mind? In oil and gas operations, that assurance comes from knowing that fuel assets are well-protected, even when they are sited in remote locations where it’s not always possible to have personnel keeping an eye on them. Recognizing the need for industrial, as well as municipal customers to have a safe, reliable fuel management system, Computrol Fuel Systems has developed a business model around their cardlock systems for vehicle fleets. Cardlocks allow fleet managers the capability to dispense, monitor and manage their gasoline and diesel consumption – as well as, increasingly, CNG, LNG and propane – all remotely. “We’re a cardlock company but we build a number of flavours of the cardlock,” said Chris Snelgrove, Computrol’s Western Canada sales manager, on the phone from the company’s base in Burnaby, B.C. To understand what Snelgrove means, you have to go back to the company’s origins more than 25 years ago, when Computrol started offering cardlock services to forestry companies in remote logging camps on Vancouver Island. The companies had fuel stations setup for vehicles and various logging equipment, but found that employees would often make off with the fuel. Diesel fuel in particular was useful, at the time, for home heating oil. The companies needed a way both to lock up the fuel and keep track of who was using it, so Computrol stepped in with a fuel management system for them. The security and convenience of a cardlock came with the added perk of not having to pay employees to protect and dispense the fuel. Municipalities and utilities also saw the benefits of the system, and many signed on. Fast forward to the present day, and Computrol is now the largest manufacturer of cardlock systems in Canada. The company has a “lock” – pun intended – on municipalities in B.C., where 80 percent of towns and cities use their services. The advantages of using their systems are two-fold. First, as noted above, they guard against theft. The second is accountability. “I’ve sold so many systems to people who say, ‘Our tanks are behind a fence. They’re in a secure compound, but our auditors say if we’re going to claim we used so much fuel, we have to be able to prove that,’” Snelgrove explained. The systems are designed to track fuel use from the instant the driver pulls up to the fuelling station. To use the cardlock, the driver needs an RFID tag or credit card authorization to turn the pump on. Once the fuel is pumped and paid for, all the data from the sale, including date and time, product identification, and volume, are recorded using Computrol’s ProFuel software. The Windows-based program compiles the data into a series of comprehensive reports, that detail fuel usage by vehicle and employee. Computrol is moving into a point-of-sale system popular with airports and remote communities, complete with chip card readers. While Computrol is familiar to municipalities, it is seeing an increased interest from the oilfield services sector. In a way that makes sense, considering the company is well established in B.C.’s gas hub, with “hundreds of systems throughout the Peace country,” according to Snelgrove. He said any company that has fuel tanks and doesn’t want to leave them unattended is a potential Computrol customer. In the oil patch, that could include drilling service companies, pipe layers, trenchers, brush cutters, and so on. Stuwalk Energy, the Husky dealer in Fort Nelson, has a Computrol network consisting of 20 systems dotted throughout northern B.C. The units are managed via satellite-based Internet and allow Stuwalk’s customers to fill up at remote areas. Each day the cardlock transactions are read at a central location and matched with the total volumes used. “We have over 3,000 customers that use these cards on a daily, weekly, monthly basis. It’s a good way to manage our fuel,” Osbourne said. Husky also has seven Computrol systems along the Alaska Highway, through its dealer in Fort St. John, Dave Smith Fuels. The systems control large portable fuel tanks located along the highway that are placed on property owned by oil and gas operators where there are no fuelling stations in close proximity. Computrol’s fuel management services can also be applied to the sale of bulk water, directed at heavy users of local water supplies, such as farmers and contractors. The company has sold a number of bulk water management systems to frac operators in North Dakota and Pennsylvania, and sees this as an increasing relevant and growing niche market for oil and gas operations. 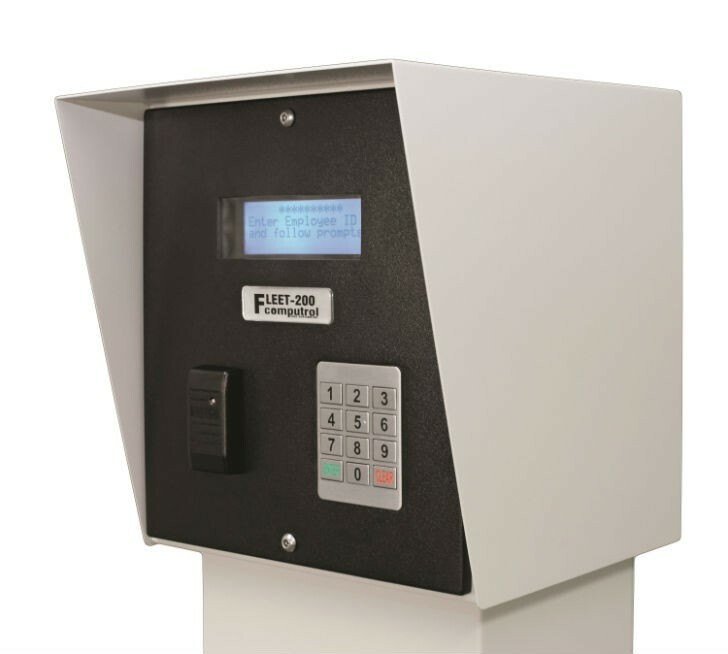 The C6000 dispensing system features a card reader system that actuates the control and delivery of water automatically, with no money on site. Computrol offers seven fleets of cardlocks, from an entry-level system designed for a small number of users all the way up to systems for large fleets with capacity to serve up to 10,000 users. According to the company, they can manage any fuel that can be pushed through a pump. This includes gasoline, diesel, biofuel, alternative fuels, lubricants or water.